There are no fossil bearing rocks of Permian age preserved in New Jersey. 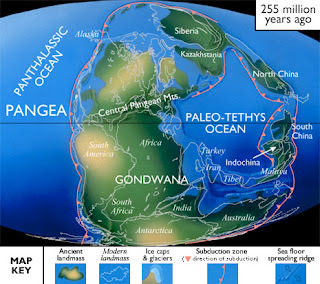 North American Paleogeography: As Pangaea was assembled, most of North America was being uplifted during the Permian. This uplift generated the famous fold belts of the Appalachian Mountains and exposed more land in present-day central North America. Shallow seas covered much of modern western North America. Large reef complexes developed and extensive evaporite deposits formed in restricted lagoons at the shoreline. Farther west, subduction began, generating volcanic activity in the region of the modern Sierra Nevada.